Woof! Cute picture of Wolf! I gotta do these fills in! That’s a great picture of Wolf! I couldn’t remember any of the real answers exactly (so sad of me…although I knew which movies most of them were from). Loved your goofy answers and that pic of Wolf is fab!!! Wolf looks like he is enjoying his present! Poor Bo, we didnt even give him his yet….. I was wondering where the other site went — with the lovely Alan in the banner? Wolfie looks cute with his toys. I’ll have to post a picture of Molly wearing her new Christmas bandana and chewing on one of her new toys. I did better than I thought. And I love the picture of the dog! I like your answers better! Hope you had a great Christmas! Michele sent me here after a really long time! I was awfully close on the Harold & Maude quote. I love that movie. Love the picture of Wolf! LOL, loved that pic of Wolf! I could identify the first quote as HP but I couldn’t finish it. I knew LOTR (they finally sorted out The Hobit movie, no?) and I got Gump. Wolf. A softer and happier looking guy I may never have seen. I don’t think that goofy Christmas tree is going to be so happy when Wolfie gets ahold of it! Well thank goodness you commented on Casa…..now I know your new url. I thought you’d deleted your bloggie self. Such a cutie boy! I really love the quotes you put up. Especially the one from Maude. She is so great! And Snape! 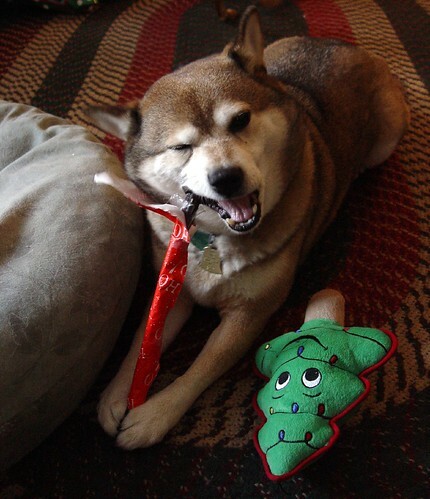 Wolf looks totally enthralled with his Christmas goodie ~ Great photo!